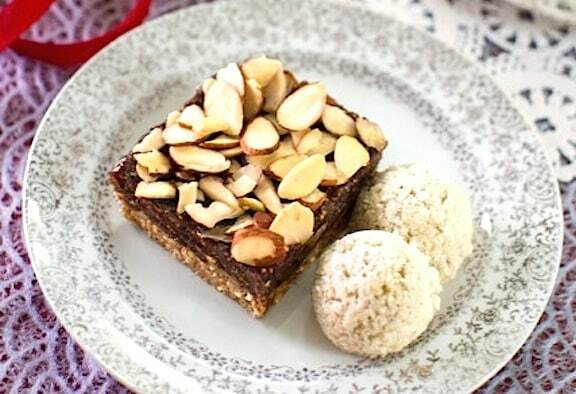 It’s amazing to me that a dessert this good can be free of refined flour or refined sugar. These fig bars have all of the chewiness and sweetness of traditional Fig Newton cookies, but they’re made with wholesome almonds, oats, and real dried figs. From Choosing Raw: Making Raw Foods Part of the Way You Eat by Gena Hamshaw. Reprinted with permission from Da Capo Lifelong, © 2014. Photos by Hannah Kaminsky. These fig bars have all of the chewiness and sweetness of traditional Fig Newton cookies, but they’re made with wholesome almonds, oats, and real dried figs. Bring the water to a boil, and pour it over the figs. Let the figs soak for at least 1 hour (or for as long as 6). Grind the almonds in a food processor fitted with the “S” blade until they’re relatively smooth. Add the oats and continue grinding until both are quite finely ground. Pulse in the sea salt. Add the Medjool dates to the food processor, along with the maple syrup and coconut oil. Process until the mixture is evenly incorporated. Press into an 8–inch square baking dish. Drain the figs, reserving the water they soaked in, and transfer them to a clean food processor. Process them with the vanilla. Add the soak water as needed, until you have the consistency of a fig jam. Spread the fig mixture over the oat/almond mixture. The fig layer should be 1⁄4 inch thick, or a little thicker. Reserve extra fig mixture to use in place of jam on your favorite toast. 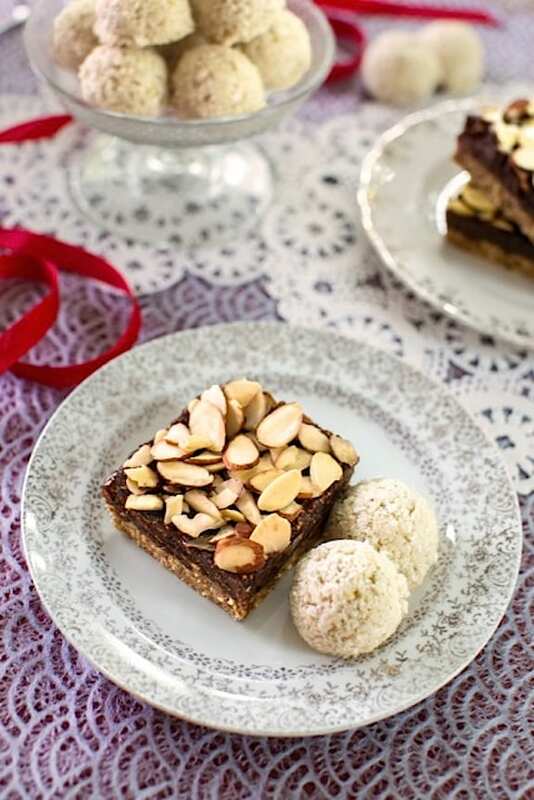 Top the fig layer with almonds. Refrigerate the bars for a few hours, until they set. Cut into nine squares, and enjoy. Store the fig bars in an airtight container in the fridge. They will keep for up to 2 weeks this way. Visit Gena Hamshaw at Choosing Raw. These are amazing! They have become my go-to snack, and also, often enough, alongside a blended frozen banana, breakfast. I can’t get enough of them! Thank you! I made these today and they tasted great, but the bottom did not solidify and was completely crumbly. I was unable to cut these bars, but had to scoop them out with a spoon. I followed the base recipe for ingredients with one extra date and a little over 1 tbls of oil, so I assume that I missed somewhere in the process. In the picture, your bars look great. How do I get the ‘look’ to match the taste? Hi Diane; sorry that this didn’t work out for you. It’s a contributed recipe and I’m not sure I can get its author to comment. However, I know the photographer well, and since she made this for the photo, I’ll ask if she can help you. Hi Diane, here’s what Hannah Kaminsky, this photo’s photographer (and sweets expert in her own right) had to say: “Hi Diane, hope I can help! It sounds like you simply needed to process the base mixture for a little bit longer. It will become stickier and more cohesive as the nuts and dates continue to break down and merge into a tacky sort of dough.” I also hope this helps, Diane.